This appears to be a completely different version of Snow White than the one Greg Easter originally designed. While this version shares some similarity with the earlier version, it is a much simpler (and more incomplete) game. 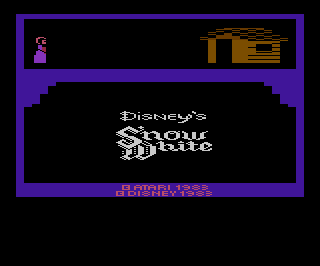 This version starts out with a nice animation of Snow White going into the dwarves cottage, after which the wicked witch appears disguised as an old woman. 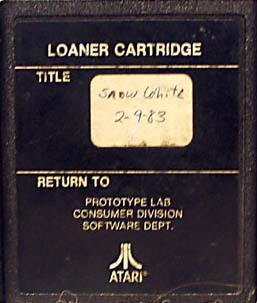 The player must then press the select button to start the game. Like the first version, the screen is separated into two areas: The 'Witch Timer' at the top of the screen, and the play area at the bottom. The Witch Timer works the same way as it does in the first version, each time the dwarf hits an obstacle the witch moves closer to the cottage. If you hit too many obstacles, the witch will reach the cottage and the game will end (the screen flashes and most of the graphics disappear). The gameplay in this prototype is very similar to the Mine Level from the first version. 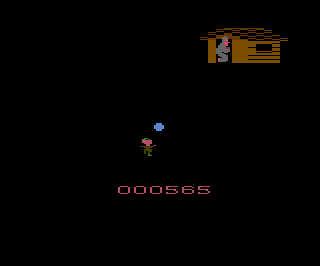 Here the player controls a dwarf that must collect diamonds while avoiding various obstacle the slowly scroll up from the bottom of the screen. The diamonds are represented as small dots that appear at random intervals on the sides of the screen. If the player collects a diamond, the diamond counter will decrease by one. However if the player misses a diamond it will count as a hit, but the diamond counter will still decrease (an obvious bug). Collecting all ten diamonds does not appear to do anything in this prototype. The controls are fairly straight forward. Aside from pressing left or right to move the dwarf and avoid obstacles, the player can press down to increase the dwarfs speed (making everything scroll faster) and press up to jump. Jumping appears to only be of use in collecting diamonds (press up when they're slightly above you), and does not allow the player to jump over obstacles. Occasionally while wandering around the mine a ladder will appear. 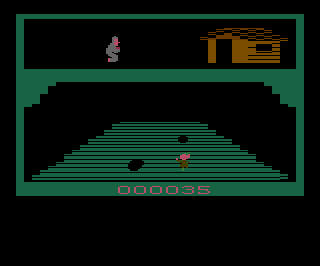 If the player touches the ladder, the dwarf will climb up and be taken to the second level. This level is similar to first, except the screen scrolls downwards instead of upwards. 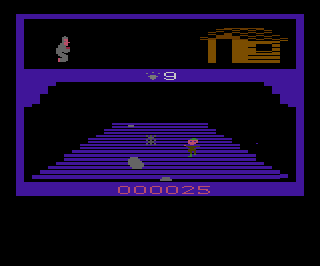 There do not appear to be any diamonds to collect on this level, and the obstacles occasionally turn black as they come towards the player (notice the boulders). This level does not appear end and there does not appear to be a way to get back to the first level. Although this version is dated later than the first version that was found, it appears to be far more incomplete (lacking sound and an ending). As a result this prototype has a 'less refined' feeling and is not as much to play. One has to wonder why Atari decided to abandon the first version of the game which was shaping up into rather a nice game. It is unknown if programmer Greg Easter had anything to do with this version, but due to the similarities between the two, it is highly likely.